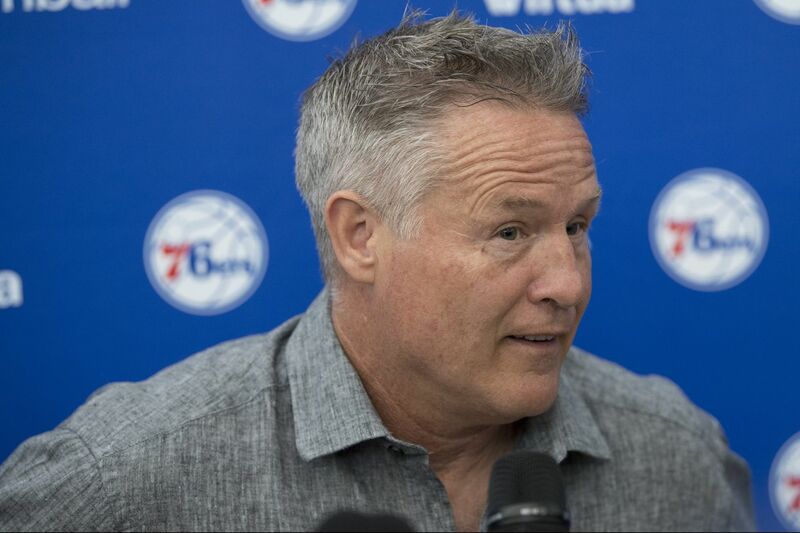 Sixers coach and interim GM Brett Brown spoke with the media minutes after Monday's pre-draft workout. This Sixers offseason started out with an unusual turn of events, and for Brett Brown, things are still twisting and turning. This is not how Brown usually spends June. He's more accustomed to watching his son play basketball or going fishing, not hunkering down with the front office executives poring over scouting material that spans years and going through the intricacies of what could and could not happen between now and the draft and free agency. But that's where he is. "It's changed dramatically for me," he said. On Monday we got the first glimpse of Brett Brown, general manager of the 76ers, the interim position added in the wake of the Twitter scandal that led to Bryan Colangelo's resignation. As the search for a new GM is underway, the show must go on for the Sixers and that means preparing for the draft. So the Sixers hosted a predraft workout Monday with six prospects: Miles Bridges, Lonnie Walker IV, Shake Milton, Jared Nickens, Nuni Omot, and Drew Eubanks. Bridges, a 6-foot-7 guard-forward from Michigan State, and Walker, a 6-5 guard out of Miami were the headliners of the workout. Both are expected to go in the first round and are possible targets for the Sixers with the 10th pick. "They had a tremendous spirit," Brown said of the prospects. "You saw different things athletically from them both. They made shots. … I thought those two guys were good today." Walker, a native of Reading, said it was surreal walking into the Sixers gym. He and Bridges said they would fit right in with the Sixers and their up-tempo style of play. It's no secret that the Sixers need a lengthy guard who can hit from three-point range and defend multiple positions. The playoffs further exposed that weakness. That's why Tuesday's workout with Mikal Bridges, a Villanova product, will draw a lot more attention than Monday's. In three years with the Wildcats, Bridges proved that he can handle himself in most situations and did so en route to two national championships. He is a threat off the dribble, can hit from deep, and is a more than reliable defender, making him a perfect fit for the Sixers. The only question is whether he'll still be available when the 10th picks comes around. The Sixers will also head into the June 21 draft with the 26th pick in the first round and second-round pick Nos. 38, 39, 56, and 60. That leaves a lot of room for trade opportunities or picking and stashing, which is where Brown's new role kicks into high gear. The planning and preparation have not slowed down. "It happens three, four, five hours every single day since Bryan's situation was determined," Brown said. "In all my years here, whether it was with Sam [Hinkie] or Bryan, you had a voice, you had a role, but not to the level that I feel it now." Not only is Brown's role in the decision making different, but the Sixers' needs and their position in the league are different from what they had been since Brown became head coach. Instead of putting together a team piecemeal based on who the best player available is or who is healthy, the Sixers now know what they need and what it's going to take to get to the next level. They have their draft targets, they have their free-agent targets, and they are ready to make moves. Although Brown is in the GM role only temporarily, he is jumping in with both feet and not afraid of the tasks that lie ahead, whether that's luring a free agent or putting together a draft-day trade. "Anything is on the table," Brown said. "We will be bold, we will be smart … we will do our homework and we will be aggressive." Those are certainly strong words, but Brown also added a hint of general manager-like wisdom. He reminded reporters that the Sixers have cap flexibility in the 2019-2020 offseason and that if the team doesn't land its intended targets this summer, it won't make careless decisions. "If we're not successful it's not like we're going to lose our minds and pivot out into something that's reckless. We're not going to do that," he said. Despite the newly acquired responsibilities thrust on him after Colangelo's exit, Brown's friendly and forthright spirit was not lost on the prospects, who all smiled when talking about their impressions of the Sixers coach. Even Nickens, who isn't expected to be drafted and is hoping to land a summer league and G League deal, soaked up every moment with Brown. "He was down to earth and straight up with us, he didn't sugarcoat anything," Nickens said. "He told us what we have to do to make it, and that if we don't do those things it'll be hard for us. He was just really straightforward." Brown is not one to change his personality with different audiences and you can bet that he'll have the same straightforward interaction with anyone else he encounters this offseason whether that's a draft pick, an agent, another team's GM, or LeBron James.